A co-creational approach to public relations puts the focus on how any organization can contribute to society. 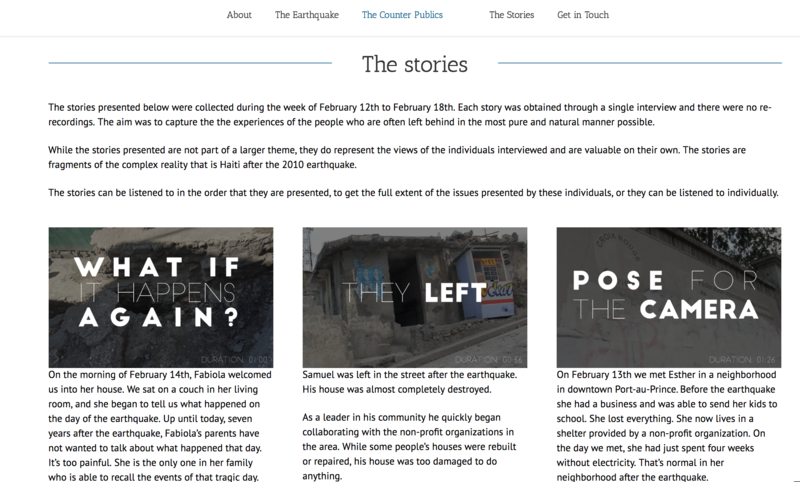 Using this approach, I looked into 10 organizations working in Haiti after the earthquake to determine the level of engagement between the organization and its publics, including its beneficiaries. The second phase of the project was going to Haiti and talking with the people who are often ignored in the organization’s needs assessments, the “counter publics.” The website www.storiesweleftbehind.com includes the research into the organizations and the first-person narrations of how the organizations engaged with the community after the earthquake. The project received the Minnie S. and Eli A. Rubinstein Research Award.